Many of the world's greatest composers are even more popular today than they were when they were living. The following composers are some of the most talented and revered in classical music. Classical music composers span a period in music ranging from the mid 1600s until around 1950. Within that period, there have been many eras that are considered "classical music" in popular vernacular. Musical eras include Baroque (1600-1750), Classical (1750-1820), Romantic (1810-1910), and 20th Century (1900-2000). These ten popular composers are from the periods listed above. Their compositions remain popular performance pieces today, and many are also used in modern media such as television and movies. Born in 1685, George Friderich Handel was a composer in the Baroque Era. His music is extremely popular today, especially his choral work The Messiah, which is performed around the world every year at Christmas. Born in Germany, Handel became a naturalized British citizen later in life. He was particularly well-known for his operatic and choral compositions. He debuted his first operatic composition, Almira, before he was 20 years old. Before composing Almira, he primarily composed chamber music and church cantatas. As Handel's music gained popularity he composed and performed for British royalty, and he became the Master of the Orchestra at England's first Italian opera, the Royal Academy of Music. One of his popular works, Music for the Royal Fireworks, was written for King George II. Along with opera, Handel composed oratorios, anthems, chamber music, and orchestral pieces. His most well-known piece of music is The Hallelujah Chorus from The Messiah. Beethoven is arguably one of the most well-known classical composers of all-time. His works are widely recognizable and still used in modern times in television, rock music, movies, and advertising. Born in 1770 in Bonn, Germany, Beethoven composed during both the Classical and Romantic eras. His work bridged the two periods, influencing many who came after him. 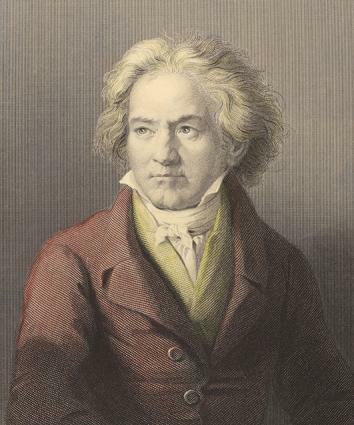 A child prodigy, Beethoven performed publicly for the first time at the age seven. He published his first work, 9 Variations in C minor for the Piano, before he was 12. Beethoven realized he was slowly losing his hearing when he was 31. While his hearing gradually worsened, he could still hear a little when he died in 1827. The pending loss of his hearing caused Beethoven to become quite prolific. He composed some of his greatest works as his ability to hear slowly declined, and his anger and melancholy over this often comes through in that music. Over the course of his life he composed symphonies, string quartets, piano sonatas, a violin sonata, and an opera. His early influences included Mozart and Haydn. Beethoven penned great masterpieces such as the Moonlight Sonata and the Fur Elise. One of his most recognizable pieces though is his Symphony No. 5 in C minor (also known as his Fifth Symphony or simply Beethoven's Fifth). A composer in the Romantic period, Johannes Brahms pieces are popular orchestral works. Children throughout the world have been serenaded by parents singing one of his most famous works, Wiegenlied: Guten Abend, gute Nacht (Good Evening, Good Night), which is more colloquially known as Brahms' Lullaby. Lyrics vary from country to country, but the melody is from Brahms' Opus 49 No. 4. Brahms composed his music during the Romantic Era. He had a close friendship with composer Robert Schumann, whose music was quite traditional. Brahms composed in a manner similar to Schumann, in contrast to more modernist composers of the era such as Richard Wagner. Throughout his career, Brahms wrote orchestral symphonies, piano concertos, choral works, chamber works, and orchestral overtures, among others. Among his most popular works are the Hungarian Dances. A child prodigy, Mozart was a well-known composer during the Classical Era. His music influenced many who came after him, including Beethoven and Brahms. Many of Mozart's pieces are instantly recognizable, and symphony orchestras often perform his most recognizable works in pops concerts. Along with composing symphonies, Mozart was a well-known composer of operas such as Don Giovanni and Die Zauberflöte (The Magic Flute). He also composed twelve variations on a very famous tune, Ah vous dirai-je, Maman. The melody is known more popularly today as Twinkle Twinkle Little Star. Mozart's music was popularized in the 1984 movie Amadeus. Johann Sebastian Bach was a musician and composer in the Baroque period. The German composer was born in 1685. His music is easily recognizable for the use of melody and counterpoint, which are played simultaneously. Some of Bach's most famous works are played on the pipe organ, such as Toccata and Fugue in D minor. Bach also composed orchestral pieces, piano works, and vocal and choral compositions. Bach was born into a well-known musical family that included his father Johann Ambrosius, who was the director of the town musicians, as well as several uncles who were all musicians. He attended the prestigious St. Michaels School where he received a choral scholarship. After graduating when he was 17, he entered a series of posts as an accomplished keyboardist and director of music. One of Bach's best-known works is the Brandenburg Concertos, comprised of six instrumental works. Born in Poland in 1810, Chopin composed his music during the Romantic Era. Chopin was a well-known pianist who composed many of his works on that instrument. Along with piano compositions, he also wrote concertos and chamber pieces. His works are tremendously popular performance pieces among concert pianists because they are so technically demanding and yet emotionally sensitive. He is also recognized as the inventor of the ballade. Chopin composed many of his works before he was 20 years old. He was a child prodigy on the piano, and his first composition was published when he was 7 years old. While he is well-known and was a significant influence on musicians coming after him, Chopin himself only performed 30 public concerts throughout his life. He spent most of his adult life in Paris. He is known for writing an extensive collection of mazurkas, and some of his more recognizable pieces include the Waltz in D Flat major (Minute Waltz) and the Revolutionary Etude in C minor. One of Chopin's most well-known works is his Nocturne in E Flat Major. The piece has been used in popular modern media, including in the television show Dexter and the movie Exodus. Like the Impressionist painters of the same era, Claude Debussy's music painted pictures with gentle waves of sound. This French musician and composer was born in 1862. He entered the Paris Conservatoire when he was ten and spent the next 11 years there. His music was different than what came before it, featuring heavily layered dissonance and resolution, along with bitonal chords and use of the pentatonic scale. In 1884, Debussy won the Prix de Rome musical scholarship, and he attended the Académie des Beaux-Arts. Along with piano music, Debussy composed chamber pieces, operas, and symphonies. He also wrote works for small groups such as trios, duets, and quartets. Among his influences were Tchaikovsky and Mussorgsky. Other composers also built on his work, including Stravinsky, Gershwin, and jazz greats such as Thelonius Monk. Debussy's works are still enjoyed today, including his piano prelude La Cathédrale Engloutie (The Sunken Cathedral). His best-known piece, however, is Clair de Lune (In Moonlight), which is the third movement of his Suite Bergamasque, a suite for piano. The music is at once haunting and uplifting. It has been used in popular modern media, such as the film Ocean's Eleven and The Twilight Saga: Eclipse. British composer Gustav Holst was born in 1874. One of his most well-known works, The Planets, is a popular performance piece among the world's greatest symphonies. While Holst played the piano throughout his youth, he was troubled by neuritis in his hands, which made long hours of playing difficult. Still, he began playing music professionally in 1893, serving as a church organist. He also worked as the choral director and had a particular affinity for choral music. As his neuritis continued to plague him, Holst took up the trombone so he could continue to play music professionally. Holst attended the Royal College of Music where he studied composition. He was greatly influenced by the work of Richard Wagner. He spent most of his career composing, performing, and teaching. He enjoyed some modest success with composing and arranging, but it was The Planets that brought Holst his greatest success, though many of his compositions, such as the Brook Green Suite, remain favorites with classical music fans. Born in 1840, Pytor Ilyich Tchaikovsky is one of Russia's most well-known composers. His music is popular performance material for symphonies and pops concerts, and his 1812 Overture is popular for its use of cannons at the height of the composition. He composed during the Classical Era. While there were few opportunities for musical education in Russia during his lifetime, Tchaikovsky graduated in 1865 from the St. Petersburg Conservatory. As he rose to fame, Tchaikovsky served as a guest conductor in Europe and the United States, including conducting at Carnegie Hall's first performance. Tchaikovsky composed chamber music, symphonies, choral works, operas, ballets, and concertos. Along with the 1812 Overture, he is known for composing one of the most popular Christmas ballets of all time, The Nutcracker Suite. Russian pianist and composer Sergei Rachmaninoff was born in 1873. He composed in the Romantic Era. His music is popular with symphony orchestras, and has been used in popular media such as the movie Somewhere in Time. Rachmaninoff was heavily influenced by the Russian composers who came before him, including Tchaikovsky and Rimsky-Korsakov. His music was lyrical and dramatic, and much of it heavily featured his main instrument, the piano. He toured in the United States at the turn of the twentieth century, and ultimately lived in exile in the US during the rise of the Soviet Union. Much of Rachmaninoff's work was composed for piano, although he also composed orchestral works and small ensemble music. Some of his most well-known pieces include the Piano Concerto No. 2 in C minor, and the Rhapsody on a Theme of Paganini, particularly the Eighteenth Variation. As you listen to different composers, you will discover eras and genres that appeal to you. Expand your playlist with different selections from your favorite composers, then branch out to other composers from the same era. Soon you'll be discovering a whole world of classical music you love.